Metro commuters faced significant delays Friday morning after a power problem led to a partial suspension of the Blue Line at the peak of rush hour. All Blue Line service was suspended in the direction of Largo Town Center for about two hours Friday morning due to a cracked third rail between Arlington National Cemetery and Rosslyn, leading to crowded platforms and workers scrambling to figure out other ways of getting to work. The morning delays spilled over onto the Orange and Silver lines, causing problems for those riders as well. 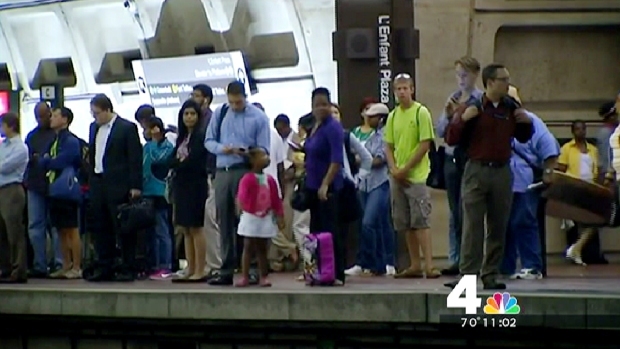 The problem has now been fixed, and Metro expects normal service for the evening rush hour. A cracked third rail led Metro to temporarily suspend Blue Line service in the direction of Largo at the peak of morning rush hour, with delays affecting Orange and Silver line riders as well. Trouble began around 6 a.m. Friday, when two empty Blue Line trains coming through the Arlington National Cemetery station developed mechanical problems and had to be towed away. Later in the morning, two or three other trains passed through the area and were damaged because the third rail was out of line. Those trains kept moving but broke down later. Metro decided to suspend all Blue Line service toward Largo Town Center, and made the announcement around 8:20 a.m.
Metro said that no trains became stuck between stations. Technicians had to walk the Blue Line in order to find the problem, a partially cracked third rail between Arlington National Cemetery and Rosslyn on the inbound track. The third rail carries power to the trains. Metro said the part on trains that connects with the third rail was being knocked off, disabling trains all along the Blue Line from Franconia-Springfield to Largo Town Center, but only in that direction. Service was restored just before 10 a.m., but trains single-tracked between Foggy Bottom and Arlington National Cemetery for about 90 minutes after that. 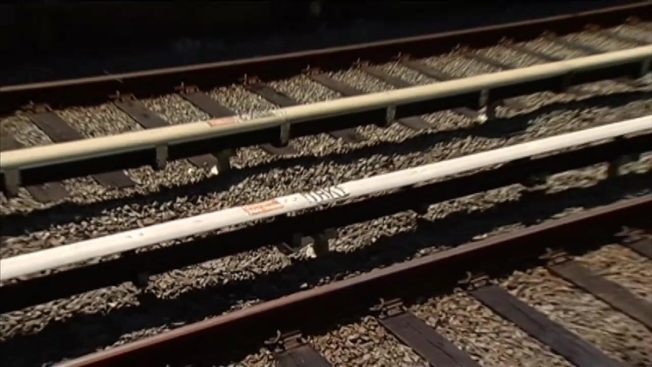 While cracked rails aren't uncommon, a cracked third rail is, Tuss reported. Metro said it's been more than a year since the previous time it happened. "It's been hectic; it's been very frustrating," said one rider whose commute is usually 20 minutes. But Friday morning, her trip to work was measured in hours, not minutes. "I'm very late, so hopefully they'll be understanding," she said. The crowds on platforms ebbed and flowed as Orange and Silver line trains came through, but the sheer number of people led many riders to hang back in hopes that later trains wouldn't be as full. "They still have to wait for this train, and chances are I won't be able to get on because there's so many people," said another rider.